January 25, 2019 – Dayco, a leading engine products and drive systems supplier for the automotive, industrial and aftermarket industries, has launched a range of scooter belts for the Brazilian aftermarket. With this development, Dayco, a company globally recognized for its premium quality products, is addressing demand from a product segment experiencing consistent year-on-year growth. The new scooter belt portfolio naturally encompasses products for the Honda Lead 110 and PCX, Yamaha NEO, Suzuki AN Burgman and Dafra Citycom 300i, which represent approximately 65% of the Brazilian scooter market. Dayco’s policy is to draw ever-closer to its partners and the launch of scooter belts is a great example of how Dayco put this into practice to meet the needs of its customers. During the process, the company conducted market surveys and customer interviews to fully understand the requirements for this product line and how to provide the additional support needed to help drive sales and maintain growth. In addition to meeting customer demand for reliable products that exceed the quality standards required for replacement scooter belts, the company also identified that customers rely on expert service and knowledgeable staff, across the country, to provide the technical information that they need. 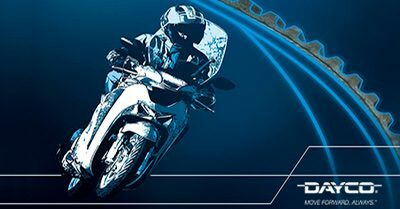 Dayco’s scooter belts are naturally manufactured from quality materials for dimensional stability, better power and engine torque, providing a high performance solution under the most demanding conditions, while also maintaining a quiet transmission system and delivering long service life. Another benefit of the Dayco offering is its specialized technical assistance, available on 0800 772 0033. Dayco brand scooter belts are available through the country’s Dayco distributors and the sales team is dedicated to supporting its customers with this new addition to its product portfolio. For more information about Dayco, please visit the aftermarket site – www.daycoaftermarket.com – where customers and technicians can find both comprehensive technical information and product support. Dayco is a global leader in the research, design, manufacturing and distribution of essential engine products, drive systems and services for automobiles, trucks, construction, agriculture and industry. Dayco’s contributions are integral to how people get from place to place, goods are transported, food is harvested, and infrastructure is built. The company operates according to long-held values — keeping promises, delivering on time all the time, and an intense commitment to service no matter what the obstacles. For more than a century, Dayco has overcome challenges, emerging stronger and smarter at every turn. Dayco improves how the world moves by creating products, systems and relationships that endure.